CEF Press® continually produces products used around the world that effectively evangelize and disciple children. Let’s take you on a behind the scenes look at the creative process for one of our exciting new products—the Bible timeline! The original timeline was too long – it required a seven-foot arm span to hold it up. The individual pieces added (or removed) with each new lesson series were difficult to manage. Although many kids really liked the timeline, it needed more color and excitement. We studied a variety of timelines for inspiration. 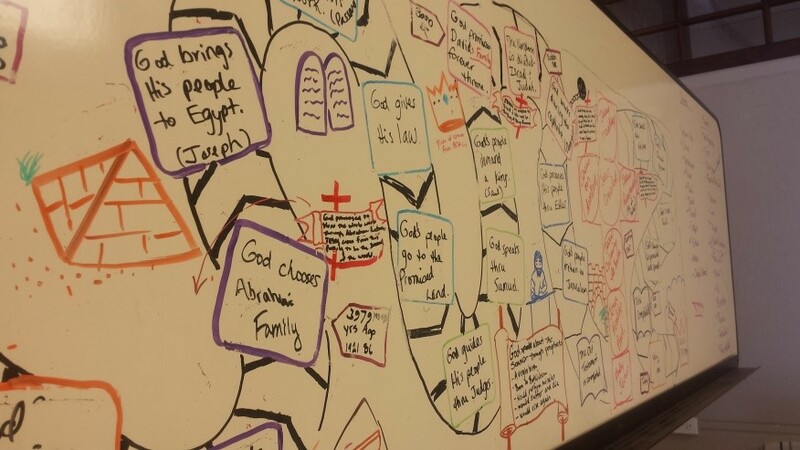 Then with colorful markers and a huge whiteboard we got to work on the initial design that would give our Bible timeline a whole NEW look! After considering feedback from many Good News Club® teachers, we concluded it would be best to print pictures directly onto the timeline. The upcoming curriculum schedule determined events to include. To incorporate the many events into the design, we chose a winding path rather than a straight line. All the pictures of Christ’s earthly life and ministry form a huge red cross – thereby squeezing more pictures into the timeline while also emphasizing the person and work of Jesus as the primary focus of all Biblical history. Gone are the days of adding and removing timeline pieces! The new timeline displays the key elements of Bible history taught in Good News Club and all you have to do is point at them! As we worked, we looked for ways to make it more kid-friendly and exciting. 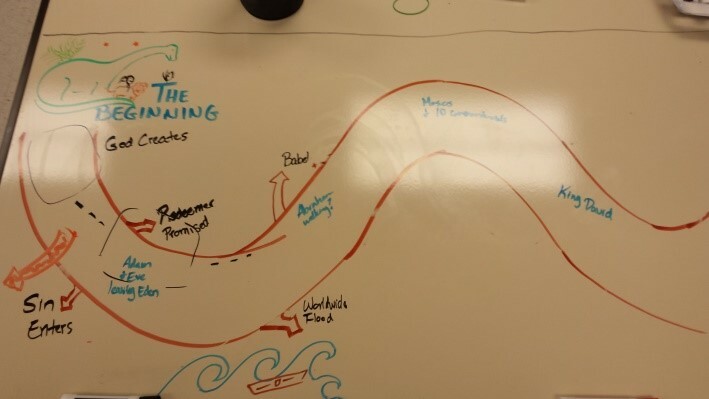 We doodled and scribbled our ideas into the background as the timeline began to take shape! Using our initial concepts, we got feedback from Good News Club teachers and others within the building – they loved it! Then, we wrote and rewrote the wording until we had it just right. We sent the concept sketches to the graphic design artist who made our dreams a reality! Then it’s proofing time! There were several times of going back and forth with the graphic artist until it was finally finished! But we weren’t quite done. We wanted it to be the proper size. So we tracked down short people, tall people and in between people and determined the timeline could be held up by any teacher. 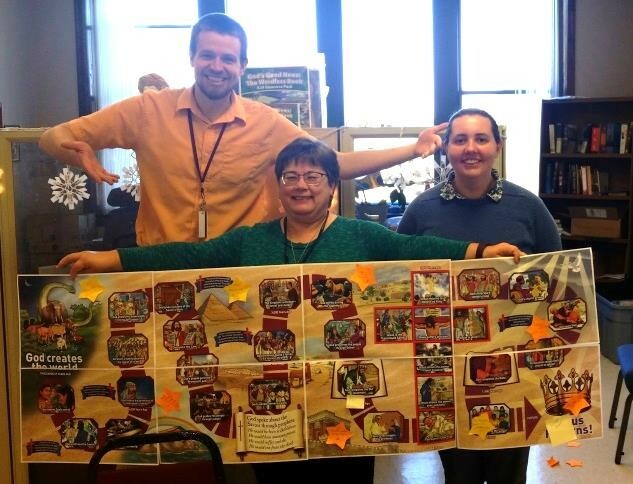 The new Bible timeline includes no extra pieces, is short enough for any teacher to hold on their own and is colorful and exciting! Mission accomplished! This new timeline will be available June 1st in the Good News Club® Starter Resource Pack 2017. We hope the children you teach will enjoy seeing how each Bible story fits into God’s great redemption plan as you use the timeline in your ministry!